Long-standing Olympic Games sponsor McDonald's has a monopoly on all catering outlets within the Olympic park in east London; there are four McDonald's on the main Olympic site and the flagship is a 1500 seater restaurant which has the dubious distinction of being the world's biggest burger outlet. French writer Marc Perelman takes up the theme of the malign influence of major sporting events in his newly published book Barbaric Sport: A Global Plague in which he deplores the "de-intellectualising" effect of sport and identifies how events such as the Olympics have "become the sole project of a society without projects". Writing in a perceptive Guardian review of Perelman's book, Nicholas Lezard describes how the toxic combination of global brands and sport "is a kind of nightmare capitalism, where, in pseudo-Darwinian fashion, ultimately only one brand survives. The grey monoculture of state communism, once the west's great fear, has been replaced by a gaudy monoculture". It is just ninety minutes drive from the Olympic park to Aldeburgh. But fortunately the much vaunted 'Olympic effect' has not yet reached Britten's beloved Snape marshes; which means my header image depicts, God willing, no more than a PaintShop Pro realised bad dream. 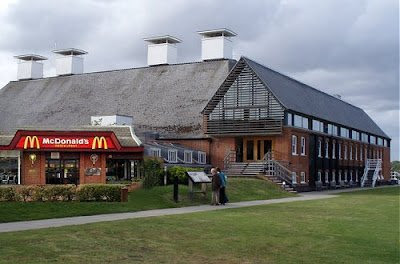 This year's Aldeburgh Festival, which finished yesterday, was Britten-lite, hopefully in anticipation of next year's bumper anniversary celebration and not because of artistic director Pierre-Laurent Aimard's reluctance to engage with Britten's music. Whatever the reason, the 2012 Festival was a feast of diversity that proved yet again that there is an alternative to the brand driven gaudy monoculture of the mainstream musical establishment - an alternative that ranged from the Monteverdi Choir in Tallis and Byrd to John Cage's Musicircus, and from Jordi Savall's passionate multiculturalism to Ives' Universe Symphony. But on July 5th Aldeburgh will feel the 'Olympic effect' when the Olympic torch relay sponsored by Coca-Cola, Lloyds TSB and Samsung visits the town. On its route the flame will pass the Church of St Peter & St Paul where Benjamin Britten and Peter Pears are buried. I suggest that at this point the Olympic torch is extinguished in deference to the beacon of cultural excellence that has blazed in Aldeburgh for the past sixty-five years - a beacon that will blaze even more brightly during next year's Britten centenary celebrations, and will continue to blaze long after the ethically bankrupt 2012 Olympics and its tawdry legacy of giant hamburger outlets are forgotten. Bob, your comment that dissatisfaction with Aimard's sidelining of Britten comes also from the U.S. (at least from Alex Ross)prompts me to offer a tangential tip re internet radio. One of the 160 or so classical music stations available, free and with just a click, on the Classical Live Online Radio site is Portland's (Oregon) AllClassical public radio. That station's frequent and often adventurous broadcasting of British composers is singular, though more singular compared to, oh, let's say BBC Radio 3 than to other U.S. stations. One of the stations well-worth checking out.